Place the yoghurt in a bowl and add the ginger, garlic, chilli powder, ground cumin, ground coriander, salt and red food colouring and blend until well combined. Make 2-3 slashes in each piece of chicken. Add the chicken to this and mix to coat well. Leave the chicken to marinate in the refrigerator for a minimum of 3 hours. In a separate bowl, mix the tamarind paste with the water and fold into the yoghurt and spice mixture. Toss the chicken pieces in this mixture and set aside to marinate for a further 3 hours. Transfer the chicken pieces to a heatproof dish and brush the chicken with oil. Cook the chicken under a pre-heated medium- hot grill for 30-35 minutes, turning the chickenpieces occasionally and basting with the remaining oil. Garnish with the onion rings,tomatoes and lemon wedges and serve hot. Hi Shabna, Tandoori chicken looks perfect n yumm. 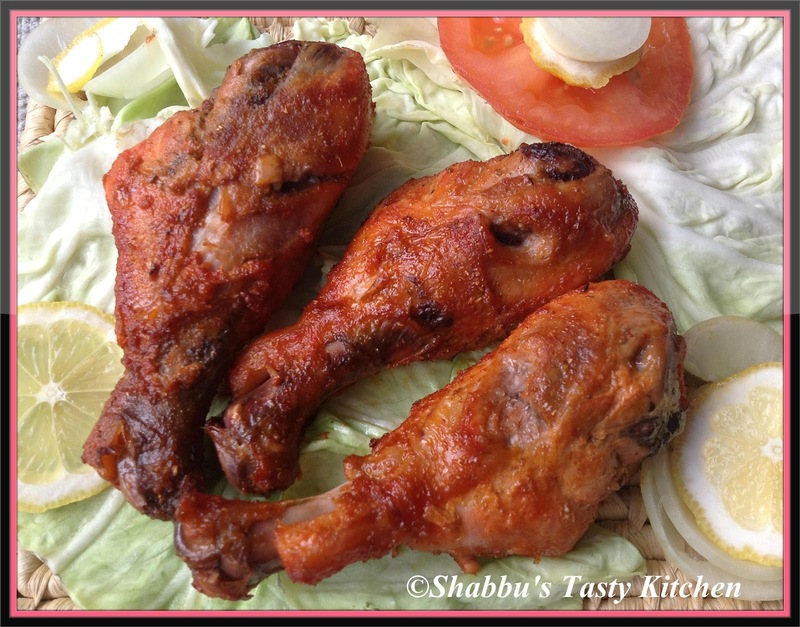 I love tandoori chicken..and without a tandoor, this is the best way to make it and enjoy..
Hi Shabna, thanks for stopping by and for the lovely comment. Wow! tandoori chicken looks so tempting..would love to have a bite from it...following u too. Wish to have for my sunday's lunch, yummy chicken drumsticks. following your space.. do stop by mine sometime..